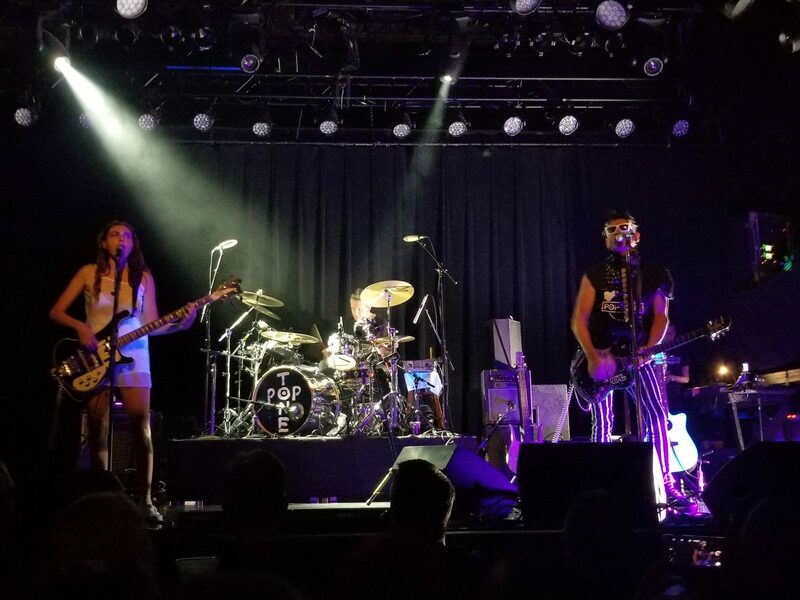 Poptone took to the famous First Avenue stage on Wednesday, June 20, and solidified everything the group was trying to accomplish by bringing the hits of Bauhaus, Tones on Tail, and Love and Rockets together in one amazing show. The crowd was a solid mix of ages young and old, new fans and longtime diehards, and all of them could be seen with excitement and enthusiasm, assuming you could tear your eyes away from the stage long enough to look. Despite creating and performing since the late 1970s, Daniel Ash and Kevin Haskins had energy to spare to recreate tunes that were designed to help us all relive the joy that music brought to us when we first heard it, and the addition of bass and vocals by Diva Dompé added a subtle extra flare. However, I am getting ahead of myself; there were two great acts and a DJ that preceded them, and they deserve a shout out. As we walked into First Avenue, we were immediately put into the right mindset by DJ Jake Rudh, who couldn’t have been a better choice to transport us back to the ’80s new-wave scene and set the mood. Tracks from Siouxsie and the Banshees, the Cure, and Depeche Mode had people dancing well before the show started and got us all ready for what was to come. 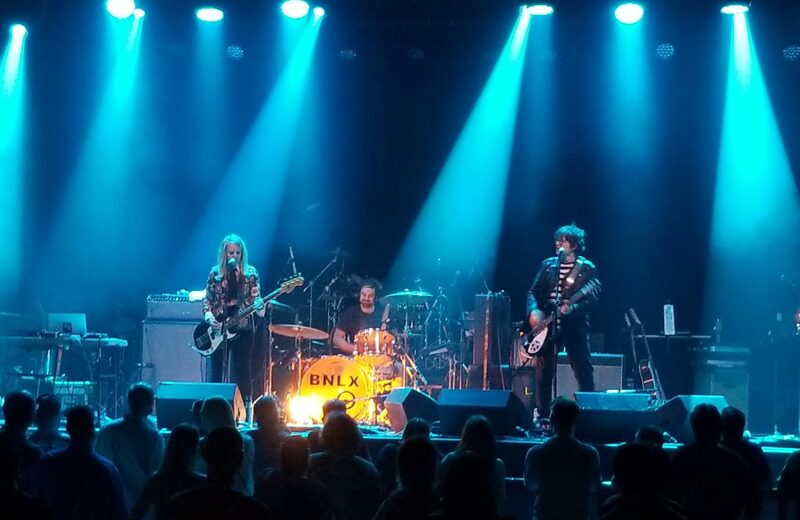 Local band BNLX opened the show with their enthusiastic mix of pop rock and post-punk with male and female vocals that all blended together; it seemed that they invoked different genres throughout each song, but it all came together in a cohesive way you wouldn’t think possible. Automatic from Los Angeles was a surprise—though First Avenue noted their presence, the Facebook event, Automatic’s Bandcamp page, and the promo info didn’t list them. So while they weren’t noted in my previous article, it was absolutely worth the surprise factor as far as I was concerned. 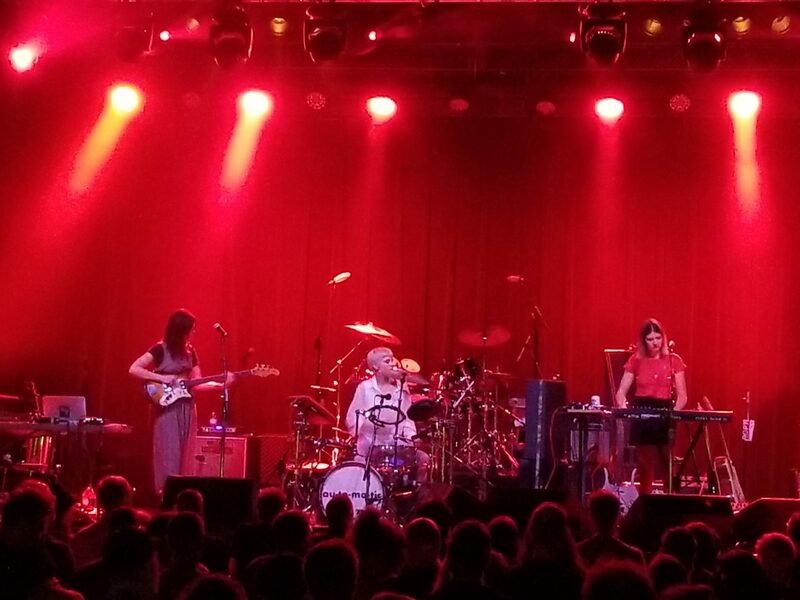 Automatic is a three-woman band featuring Lola Dompé (sister to Diva and daughter to Kevin Haskins) on drums, Izzy Glaudini on synths, and Halle Saxon Gaines on bass, with all three contributing to vocals. Certainly with Lola they had the power of name recognition, but they didn’t need it. All-female bands are a rarity, and these three were a powerhouse of talent and beautiful music that showed new-wave and synthpop influences. They would have dominated the scene 30 years ago. I want to hear and see more from them, and you should absolutely look into them. The moment we were all waiting for seemed to come quicker than we had anticipated; I wasn’t prepared for the excellence of what we were soon to behold. Ash, Haskins, and Dompé mounted the stage, and the crowd immediately surged to attention. They covered a number of songs from their lengthy catalog, which seemed to be almost half Tones on Tail and half Love and Rockets with at least one Bauhaus song in there. Songs I didn’t think I’d recognize I somehow knew instinctively, the crowd sang and danced along with them, and Ash offered up a commanding performance that had the audience in thrall. Their music defies genre: for some it’s post-punk, some goth rock, some new wave, and for Ash it’s just pop music. If one were to be forced to define it, it’s all of those things at once and yet not at all, but it is certainly popular. First Avenue’s mainroom was full with a decent number of people up on the second floor as well. Haskins was unlike any drummer I’ve seen, completely involved in high-energy drumming and yet completely composed, almost zen, with a smile on his face. Dompé was masterful on the bass and was utterly flawless from track to track. There were so many moments of music that I, and I’m sure many others, never thought we would see live, and these three people gave us that opportunity with such exceptional form that you wanted to close your eyes and shut out everything but the music—but if you did that you’d miss the stage presence. Ash playing a saxophone during “Movement of Fear” was amazing, and he played directly into the music, directly to the fans, and brought out that taste of jazzy-ness. 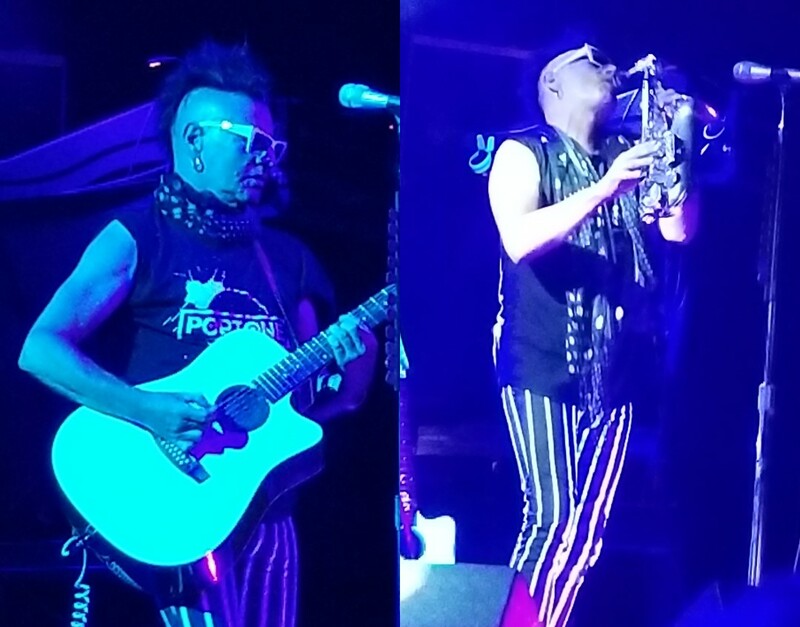 It of course would not be Poptone without breaking out the standards we know and love, such as Love and Rockets’ “Haunted When the Minutes Drag,” “Tones on Tail’s Go!,” and Bauhaus’s “Slice of Life.” The show was and probably will continue to be the highlight of my year. Poptone continues the album tour up into Canada and then down the East Coast. Daniel Ash is working to create more solo work to be found on his website, Kevin Haskins’s book is still available from Cleopatra Records (and is absolutely beautiful by the way), and music from Automatic and BNLX can be experienced on Bandcamp. Keep them all in your sights, because when they play again, you will want to be there. Vanessa has an obsession with Nintendo systems, Dragon Age, Mass Effect, and The Sims. She is an EBM- and industrial-loving goth who takes entirely too much delight in absurdist mashups and inflicting them on others.